Over the past five to 10 years a great amount of funding has been spent aimed at helping residents increase recycling rates. This isn’t solely about caring for our environment, although that clearly is important; it’s also the financially sound way to manage the limited resources we have as a borough. Whenever we put rubbish into the black wheelie bin a large number of people believe the only cost incurred is that of sending the bin waggon to collect it. But of course it has to go somewhere. Landfill costs have increased dramatically and will continue to go up as the government use the ‘Landfill tax levy’ as a financial deterrent against local councils, to push up recycling rates. So, even if we owned our own landfill site we’d still pay the tax to government. So, even if we were to recycle at the same rate – the cost of what we do send to landfill goes up, and up, and up. And we are not talking small sums of money. Last year we sent 39,637 tonnes of household waste to landfill at a cost of £270 a tonne. That’s a whopping £10,701,990 – almost £11m! To put that into context the whole ‘Neighbourhood Services’ department budget, which pays for street cleaning, libraries, community centres, parks and countryside services, street lighting, road maintenance – so everything you see – was £14m in total. So if we increase recycling (or even just stopped producing waste in the first place) we would save the town a serious amount of money which we can use to offset the cuts to council services from central government. And that surely is a better option? With recycling rates now at 37 per cent (down two per cent on the previous year) we can and must do better as a community. If we can increase that by just five per cent we will save more than £500,000 – and that could make a real difference. For instance it would pay for all our district libraries. We know that the current system can take a while to understand – what exactly can you recycle? I was baffled when I was told yogurt pots couldn’t be included. But it isn’t impossible to understand, it just takes a moment to get used to the system. We’ve invested in the containers – people can’t say they don’t have enough bins – and we’ve invested in a reliable collection service which aims for 100 per cent collection rates. Clearly that isn’t always possible, due to a host of reasons, including parked vehicles or human error, but we are not far off. We’re working with Greater Manchester Waste Disposal Authority to get the information out to communities and we are also taking the messages into schools so our pupils are educated from an early age. 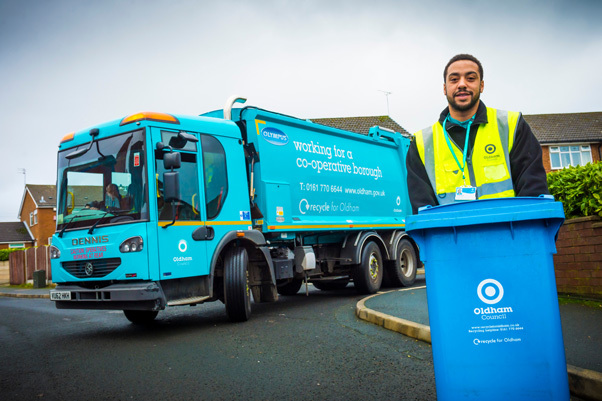 We’ve invested in enforcement – we’re not fining people for leaving bin lids open more than 45 degrees, but persistent offenders who believe that they can fill two to three bins to the brim with waste they haven’t bothered to separate, effectively creating two or three ‘black bins’. We try to educate before taking enforcement action and we have seen real improvements with our ‘Changing Behaviours’ programme. Of course not all waste has to come to the council for recycling. Increasingly the ‘Reduce, Reuse and Recycle’ message is beginning to come through more and more. Websites like Oldham Freecycle let residents’ list items for free so that others who can get use out of them will come and collect. I’ve used the site and without fail the goods have been collected within hours – quicker than a bulky goods collection could have taken. The government does need to do far more than simply punish communities with landfill taxes. One of the biggest generators of waste are our very wealthy supermarkets which continue to over package food. They claim consumers now expect fruit and veg to look neat and pretty, I think that’s a poor excuse. Perhaps a ‘landfill generator’ tax to supermarkets would focus minds? Until then we’ve got to do what we can to reduce the cost to Oldham. Now some of course will say ‘that’s what I pay my council tax for’, which of course is true. But it makes no more sense than it would to turn your heating on full blast and leave all your windows and doors wide open. You could do it, but it makes no sense. If we all recycle more that will save money and that could have a big impact when we are forced to look at cutting services our communities rely on. Surely this has got to be an easy win?